Part II – What to do when Centralized Control does not work? When you might need a Strategy? They all are used by the player the same way – press a key, and wait for an animation to end. The class that uses them shouldn’t know the difference between one and another, so it won’t be dependent on their implementation – the skills are interchangeable. They can be switched between the keys on the fly. They change the player somehow, so they need a reference to him or a proper player’s interface. We assume that skills are very different, so we cannot extract common parameters for them. In that case, the best solution is to pass the player’s object to them (if a ‘Dependency Injection’ term came up to your mind, you’re damn right). You want to add/remove/update skills independently from the rest of the codebase, and you probably wish to have a painless way of doing that. You’ve got a Strategy abstract class that the Context uses. Concrete strategies derive from a Strategy to define a particular behavior. Each of them has its class so that they can be defined independently. Context is configured with a concrete strategy by another class or by itself. 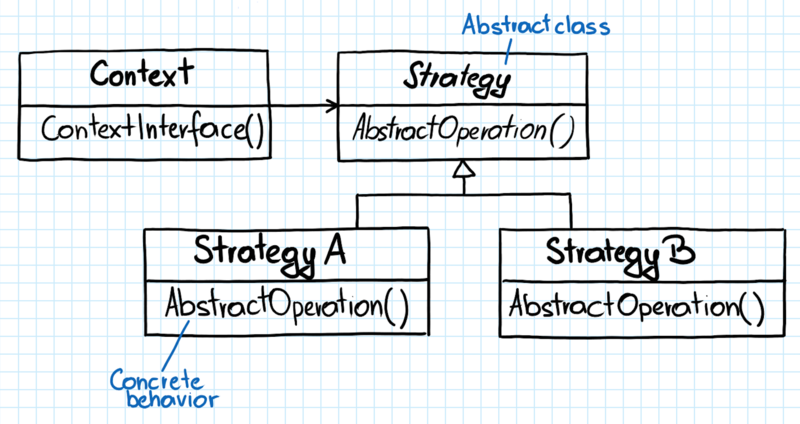 It delegates the operation to its current strategy class to avoid switch statements here and there. The simplest solution is probably to call an event in SkillBar script every time the player had pressed a proper key. Catch that event in the UIController, which has a reference to the player, and cast a chosen skill from there. The above solution lets you add many skills without worrying that it’ll affect the rest of the game. You don’t have to have switch statements with a case for every skill. 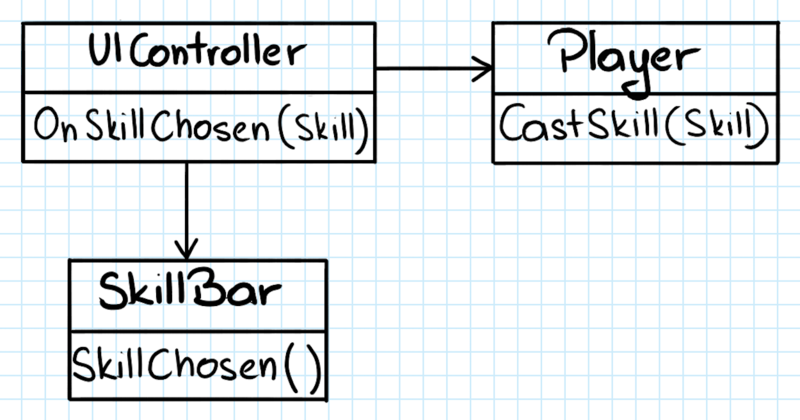 You don’t need an additional enum field in skills or dynamic casting to know which skill is it. You may have a few other programmers working on their skills implementation without interfering with each other. How does it sound? Gameboard delegates a few different operations to the GameMode Strategy. We’ve got a Chess game and two modes: Classic and Battle. StartGame(): Set up chess normally. EndGame(): Clear out the board and show statistics. StartGame(): Set up chess and randomize positions of a few pawns for both players. EndGame(): Clear out the board and show statistics (same behavior as Classic). OnPlayerMoved(): Disable random empty field, so the chess cannot be moved there. And Gameboard doesn’t know about any of that. It is initialized with a particular GameMode depending on a button the player clicks. 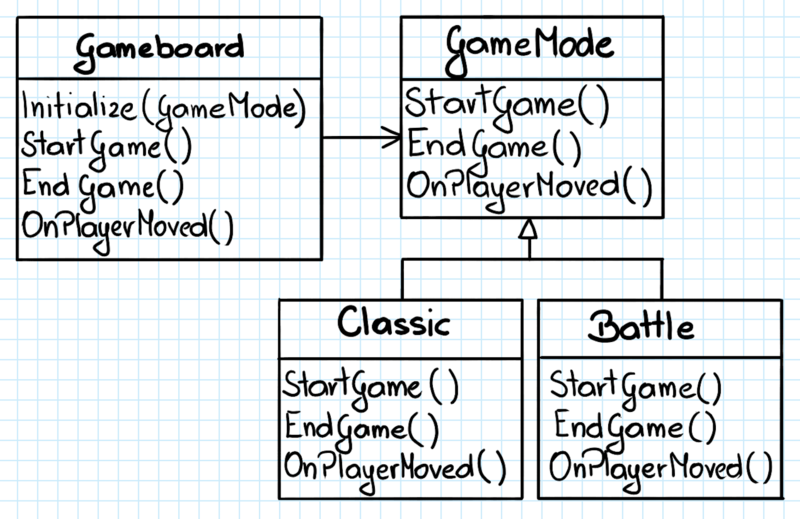 All its operations which behavior depends on a game mode are delegated to the Strategy pattern. Do you need a new game mode? Create a new class that derives from a GameMode, implement its abstract interface and place a new game mode button in the menu. Simple as that. It is worth to mention one more variation of the pattern. If you’ve got many operations in the Strategy and a bunch of game modes that differ only in one or two of them, you can have a default game mode with virtual methods. It would be placed between the abstract class (GameMode) and concrete strategies (Classic and Battle). If your game mode doesn’t change default behavior it doesn’t override its method. Today, we haven’t mentioned the Singleton. The Strategy MIGHT help you avoid using Singleton, but it isn’t its primary purpose and the biggest advantage. However, it is a very precious tool in your arsenal as many games would make a very good use of it. 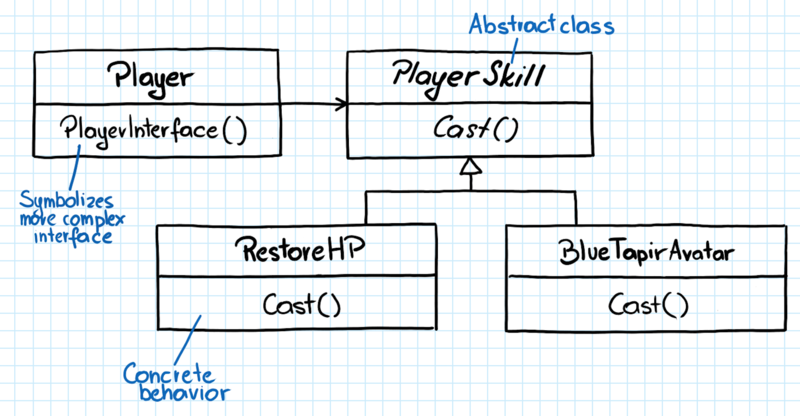 In the next post, you’ll see a design pattern that is very similar to the Singleton but somehow better. It should fill all the gaps that we haven’t filled yet. And now I wish to ask you for advice. Tell me how do you feel about the Games Architecture. Do you think that I should change something, or everything is perfect for you? Maybe you’ve got a particular problem and want to share it with us so we can think how to solve it together? I’m here, and I can hear you. You have a base MonoBehaviour class that choices what behaviour that entity will use, based on scriptable files. It is like “Ok, now I want my entity to be more aggressive, so my MonoBehaviour will point to the AgressiveScriptable and perform its behaviours based on that. With a simple “drag and drop”, the agressive behaviour can be switched to a more peaceful behaviour, for example”. Is this an example of the Strategy Pattern?